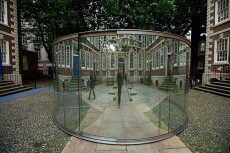 The 7th edition of the Liverpool Biennial opened to the public today, presenting work by 242 artists in 27 locations. The festival takes place in galleries, museums and sites across the city and includes a dynamic programme of talks, events, screenings and family activities. Participating organizations and venues include The Cunard Building, The Bluecoat, Everton Park, FACT, Liverpool ONE, Metal, The Monro, Open Eye Gallery, Tate Liverpool, Mitchell’s Bakery, LJMU Copperas Hill Building (Lime Street), the Walker Art Gallery, Victoria Gallery and Museum, and The Royal Standard. 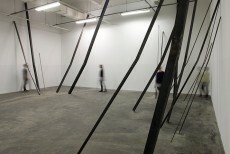 Liverpool Biennial 2012 explores the theme of hospitality, and invites a wide range of artists and thinkers to bring forth new understandings on the subject for our increasingly globalized and complex times. For the main exhibition, ‘The Unexpected Guest’, sixty leading and emerging artists from around the world have been commissioned to make permanent and temporary public art works, as well as long-term community-based projects. 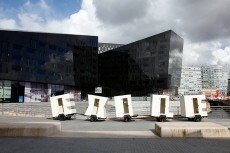 Other highlights include Israeli artist Oded Hirsch’s lift that bursts through the floor of the Liverpool ONE shopping centre; acclaimed US artist Doug Aitken’s Sky Arts Ignition Series video commission, installed alongside Tate Liverpool in a temporary structure designed by the British architect David Adjaye; the precariously placed sculpture Refraction by Argentine artist Jorge Macchi, installed in Liverpool’s former postal sorting office; José Ángel Vincench’s series of five mobile trailer homes, Exile, which makes its way around the city throughout the biennial; and Dan Graham’s pavilion 2-Way Mirror Cylinder Bisected By Perforated Stainless Steel, placed in the forecourt of The Bluecoat (all pictured left). ‘City States’ brings together forty artists from seven countries, exploring the dynamics between cities and states with new and existing works. It presents work from cities including Copenhagen, Gdansk, Hong Kong, Incheon, Lisbon, Makhachkala, Oslo, Reykjavik, and Vilnius. In partnership with Liverpool John Moores University, the LJMU Copperas Hill Building will host both ‘City States’ and ‘Bloomberg New Contemporaries’. ‘Bloomberg New Contemporaries’ showcases the best contemporary work from art schools around the UK. 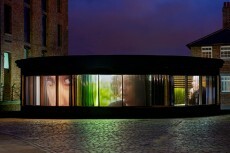 Established in 1949, New Contemporaries is a founding partner of Liverpool Biennial. The ‘John Moores Painting Prize’, the most celebrated contemporary painting prize worldwide, is on show at the Walker Art Gallery. The Royal Standard, Liverpool’s artist-led studio space, presents ‘Service Provider’, an exhibition that explores the role of biennials in contemporary art. The Victoria Gallery and Museum, participating in the Biennial for the first time, presents an exhibition by Liverpool-based artist Paul Rooney. Every weekend of the Biennial has been curated to ensure that each of the ten weeks of the festival has a distinctive and exciting programme that includes film, performance, comedy, music, archaeology, expeditions, poetry, dance, and a Young Peoples’ Biennial. 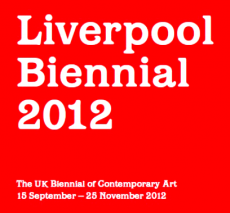 Art / Books is proud to publish the companion publication to Liverpool Biennial 2012, The Unexpected Guest. Edited by Sally Tallant, Director of Liverpool Biennial, Paul Domela, Programme Director of Liverpool Biennial, the book features art works by artists in Liverpool Biennial 2012, a selection of new writings compiled by American poet and critic Kenneth Goldsmith, and newly commissioned essays by some of the world’s leading thinkers – all on the Biennial’s theme of hospitality. Sign up here to our mailing list to join The Art / Books Circle and to receive regular news, updates and offers. Copyright © 2012 - 2019 Art Books Publishing Ltd. All rights reserved.